Reading Darrell’s recent post 7 iPad Habits of Highly Effective Remote Workers prompted me to look more closely at how I can really do work on my iPad (s aapl). I have to admit, I’m still not convinced that the iPad will be my laptop replacement. However, with the help of the Apple wireless keyboard and some other peripherals and apps, it can come close. Here are some tips to make your iPad work-worthy. 1. Make audio calls via VoiP. Audio calls via Skype (s msft) on the iPad work like a dream. Just plug in the earbuds that you usually use for your iPhone, fire up the Skype app and make your audio calls. There are other VoiP apps that will work on the iPad without charging fees, such as Viber, but they require that the other person also has the same software on her device. You can even use Google Voice on the iPad, (s goog) albeit with a little extra elbow grease. 2. Editing images and video. You can get digital photos and videos directly from your cameras using the Apple iPad Camera Connection Kit, which comes with a USB adapter and SD Card Reader. I was a little skeptical about using the iPad touchscreen for editing images, but after downloading and trying the free PhotoPad by ZAGG, I’ve found it makes it fairly easy to manipulate images, including color and contrast adjustments, rotating and sizing, adding color fills, and even treating images with filters. You can also get Adobe Photoshop Express (s adbe) for free if you’re already familiar with Photoshop. For video, an app like Splice can help you do some basic video editing (including combining photos and video) for free, or there’s Splice Pro for $1.99. For more editing oomph, you can go for iMovie for $4.99, although it requires a front-facing camera on your device (so iPad 2, iPhone 4 or 4th-generation iPod touch only). 3. Recording voice memos and podcasts. There are a variety of voice memo–recording solutions you can use on your iPad using its built-in microphone, including Voice Memos for iPad by KendiTech, which is similar to the Voice Memos app on the iPhone. For 99 cents, you get the basic version; for an additional 99 cents via an in-app purchase, you get the ability to trim your memos, email memos and download to your computer via USB. The export button makes your memos available via iTunes File Sharing. QuickVoice is another iPad option to record and email audio clips up to 5 MB in size for free. The $2.99 to upgrade to QuickVoice Pro can handle up to 20 MB clips. You can record and export audio clips via iTunes for free using iRecorder voice memos. If you want more editing features, try GarageBand ($4.99). Although it features instruments, you can use it for podcasting as well. Here’s a little voice recording hack I learned from a fellow podcaster: You can use the Camera Connection Kit and USB adapter to plug in a lightweight USB microphone to your iPad to increase the quality of your voice recordings. Using a USB mic also helps to cut down on background noise that the built-in iPad mic might pick up. When I tried to use my high-end Rode Podcaster microphone, my iPad told me it required too much power, so it did not work. But when I plugged in the Konami microphone (s KNM) from my Wii Glee Karaoke game (s ntdoy), it worked pretty well. A quick search online reveals that some podcasters use the Blue Microphone Yeti with their iPads. 3. Powering slide presentations. 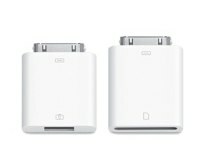 If you’re looking to connect your iPad (or iPhone or iPod) to a standard LCD projector or other VGA-compatible display, you can purchase the Apple VGA adaptor for $29. You can also opt to invest in a handy, super-portable projector, such as the MicroVision ShowWX Laser Pico Projector, starting around $199, or the Mili Pro 2.0 Projector, for around $369.95. To make sure that your PowerPoint presentations are easily accessible on your iPad, check out MightyMeeting, an app that I wrote about recently. Thanks to a recent update, you can also now control your Keynote slideshow presentations on the iPad using an iPhone or iPod touch. 4. Editing Microsoft Office docs. For an app that provides combined file storage with Microsoft Office document editing, check out Soonr, which I wrote about recently. Alternatively, you can also use other file storage/sync solutions, such as Dropbox and SugarSync, and combine them with editing apps like QuickOffice and Documents To Go to provide similar functionality. What apps, peripherals and hacks have you tried to make your iPad work-worthy? For use of some USB mics that require too much power than the iPad can give, a little trick: Connect the USB mic to an AC-powered USB hub (with nothing else plugged in) and then connect to the iPad! I use news aggregator apps like Zite and Pulse to help stay on top of the mobile industry. These apps are great “lean back” apps – something I couldn’t do comfortably on a laptop. I also use Evernote but often found it too big for simple information storage so I use something called Day One – works on the iPad, iPhone and Mac OS. For writing I use iA Writer. It has a KILLER keyboard mod that makes it a joy to use the virtual keyboard. I’ve left my notepad behind because of the iPad and now couldn’t do what I do without it. I’m curious: how does iA Writer modify the keyboard, Rob? It adds a top line of keys that allows you to jump to the next/previous word, get at much-used punctuation and keys that move the cursor one space forward/back. Small tweaks but makes typing so much better. Goodreader – PDF annotations and dropbox integration. Enough said. Note taker HD – no more need to kill trees and I can PDF the notes I take and easily email and archive them. Powerone financial calculator – simple and powerful rpn calculator. Try this … on an iPad, iPhone, iPod touch or Android device. Our App ImageAMMO can take powerpoint, keynote, pdf and place them in a very unusual interactive 3-D shape environment … mageAMMO for iOS presents your images to the world in a unique, dramatic, and interactive way. View your whole collection of photos all in one simple to use app. Use it as an inventive sales or education tool, product image display, or amazing slideshow. Rediscover your pictures; it doesn’t get easier than this! Using your existing photo library, ImageAMMO for iOS will generate and animate 3D shapes. You can interact with the display naturally by simply touching your screen. Tap a picture to bring it forward for a closer look. Touch and drag to spin the shape. With a VGA connector or Microvision SHOWWX Pico projector*, you can turn your iPad or iPhone 4 into a portable presentation powerhouse. Just connect, launch, and amaze. Your device turns into a controller for the show allowing you to quickly and easily respond to questions and feedback from your audience. I definitely can recommend Evernote as well. Once you get your folders set up and begin playing with it, you can find a lot of different information to plug into it. Syncing with all your iOS devices, Mac, and PC make Evernote very versatile. I recently purchased the newest Eye-Fi memory card for my camera. Now the card in the camera automatically sets up an ad hoc Wi-Fi network with the iPad and automatically uploads photos to the iPad almost as fast I can take the pictures. Photogene is the iPad app that I have been using to crop and edit the photos from my camera. Taking notes during phone calls and meetings is one of the most common business tasks. An app called Evernote works great for organizing notes, and the companion website automatically syncs the notes to your computers, phones and iPads. And since I always need music while working, the Sirius/XM app is a must have. The Eye-Fi sounds neat! http://www.eye.fi/ And Evernote, oh, that! I am still trying to embrace Evernote. Not yet part of my everyday note taking but lots of folks love it. I second the vote for Evernote. It has become an essential tool on my iPhone, Mac at home and PC at work. Awesome. Which eye-fi card did you get? My Eye-Fi is called the Pro X2. There are other models, but this particular one said “Ad hoc networking” on the package. Or you could just use a computer, instead of all this headache. When the emphasis is mobility, one device beats four. Of course a laptop would be better (debatable) but how do you NOT love an ipad? They have an ipad/iphone/bberry/android app of course, but you cant beat the plain simplicity of it. Also, they just released a push to mobile device option, which works the way it should.